Tim Wirth, the former U.S. Senator from Colorado, remembers when Congress debated the possibility of a nuclear winter. Back in the mid-1970s, when Wirth was still a congressman, he participated in these hearings, which focused on how radiation from one nuclear weapon could carry across the world to other places. It was during this time that he first became concerned with another potential international calamity: climate change. "As part of that, there were hearings on atmospheric change," he told Fusion. "We heard from Carl Sagan, Stephen Schneider, and some of the best tutors in the world." In 1988, two years after being elected to the Senate, Wirth organized the first widely publicized hearings on climate change, in which James Hansen, a climatologist at the Department of Earth and Environmental Sciences at Columbia University, testified that global warming is "already happening now." In hindsight, data show Hansen wasn't exaggerating. There hasn't been a month below the 20th century average for more than 366 consecutive months, dating back to February, 1985, some three years before the hearings. So far, 2015 is on track to be the hottest year on record by a wide margin, even as 14 of the 15 hottest years on record have occurred since 2000. A New York Times story from the day after the Hansen hearings, June 24, 1988, quotes then-Senator Wirth as saying that the "scientific evidence is compelling: the global climate is changing as the earth's atmosphere gets warmer. Now, the Congress must begin to consider how we are going to slow or halt that warming trend and how we are going to cope with the changes that may already be inevitable." In 2015, Congress refuses to even consider how to confront climate change, thanks to a united front of Republicans and fossil fuel interests. At the same time, momentum is building for the early-December climate talks in Paris, where countries hope to hash out the first global agreement since the 1997 Kyoto Protocol, for which Wirth was the lead U.S. negotiator. To Date, around 90% of the world's greenhouse gas emissions have been accounted for by the 150 individual country commitments already made in the lead up to the critical Paris meetings. Former U.S. Sen. Tim Wirth attends the National Clean Energy Summit 2.0 at the Cox Pavilion at UNLV August 10, 2009 in Las Vegas, Nevada. Wirth is not overtly critical of the lack of progress over the intervening quarter century since he helped organize the Hansen hearings along with current Secretary of State John Kerry and former Vice President Al Gore—Both of whom require no introduction as fellow career climate change advocates. Wirth said in the beginning "they knew so little about what to do and what would work" that it took years to "begin to fully understand the politics and science." Wirth was present the first time representatives gathered from around the world to discuss climate change, the 1992 Rio Earth Summit, which he said was a "very moving experience." He thinks that now, 23 years after Rio and six years after the Copenhagen climate summit, which he considers the "nadir" of climate negotiations, what comes out of Paris is probably "going to be pretty good." This is in large part due to the growing collaboration between the United States and China, the two biggest greenhouse gas emitters. Over the last year the two countries have signed a forward-looking bilateral agreement to cut emissions and committed work together to improve clean energy technology and finance. These brutal and very nasty politics are a cause of campaign donations. With other countries lining up to participate in the climate talks, Wirth sees climate change deniers as the biggest remaining stumbling block. "Especially the Kochs," he said. "Big, highly funded armies trying to destroy what they think is an effort to destroy the economy." "These brutal and very nasty politics are a cause of campaign donations," Wirth continued. "The government is for sale, and in no place is the bank of government clearer than in energy politics. Couple that with Citizens United, and you can see the evils of money—only negative, nothing positive." Wirth said the most surprising thing about the evolution of the climate change debate over the years has been the arrival of Citizens United, "which has managed to mobilize a vast amount of money and therefore political power." This power has been amplified by the "know-nothing" nature of so many in Congress, according to Wirth, those who "don't know anything about science, and don't want to." Now we're fighting all of these entrenched financial commitments of deniers. "Citizens United came along and stuffed everything with money," said Wirth. "Now we're fighting all of these entrenched financial commitments of deniers." Citizens United refers to a 2010 Supreme Court ruling that declared it unconstitutional for the government to restrict “independent” political spending by corporations and unions. Overturning a 100-year-old precedent, it has opened the floodgates for corporate campaign contributions. Wirth said this really has an impact on members of Congress who need money to get re-elected. He said when he first ran for Senate in the 1980s, he raised and spent between $5 and $7 million. Now, according to Wirth, people in the same position like Mark Udall, who recently lost his Senate reelection campaign in Colorado, raise up to $85 million. "It just paralyzes everything," he said. Wirth is far from alone in claiming that Citizens United changed the debate around climate change. Rhode Island Senator Sheldon Whitehouse, who has made acting on climate change a personal crusade in Congress, said on the Senate floor in 2014 he believes "we lost the ability to address climate change in a bipartisan way because of the evils of the Supreme Court’s Citizens United decision…That decision did not enhance speech in our democracy; it has allowed bullying, wealthy special interests to suppress real debate." Whitehouse said that "before Citizens United, there was an active heartbeat of Republican activity on climate change…But after Citizens United uncorked all that big, dark money, and allowed it to cast its bullying shadow of intimidation over our democracy, Republicans—other than those few who parrot the polluter party line that climate change is just a big old hoax—they have all walked back from any major climate legislation." Even before Citizens United, many politicians were already in the either the pocket or the cross hairs of fossil fuel companies. Wirth told me that after 60% of the Annex I countries agreed to the Kyoto Protocol, effectively putting it into action, it sent the Senate "into a spiral." He said the energy companies would sit outside of the congressional negotiations around the Kyoto Protocol "almost like black hats" telling people on the Hill what kind of horrible things the agreement would do to the energy companies and the economy overall. A recent investigation by InsideClimate News has revealed the extent to which Exxon went to cover up the role of fossil fuels in global warming starting in the 80s. 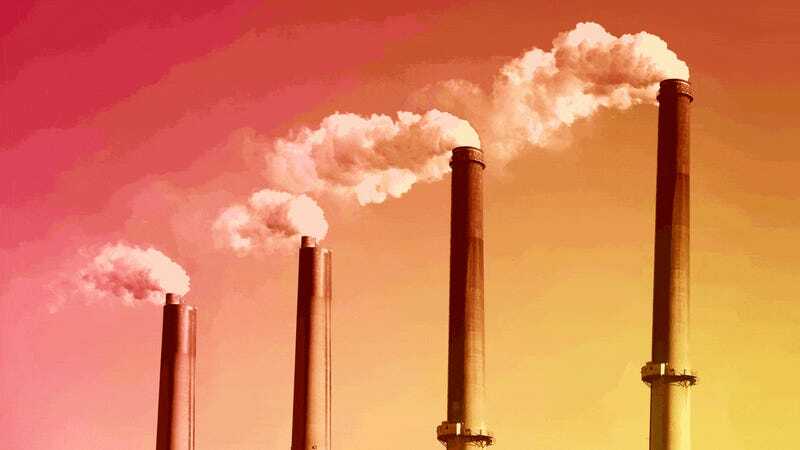 According to the extensive investigation, top executives were warned of the possible catastrophic impacts of greenhouse gas emissions, only the then try and block efforts to publicize the data and discover solutions to the ever-worsening problem. In the end, the U.S. Senate never ratified the Kyoto Protocol. In fact, after the U.S. negotiators signed the accord in 1998, the Senate responded with unilateral rejection, voting 95-0 in support of the 1997 non-binding Byrd-Hagel Resolution, which said the treaty "could result in serious harm to the United States economy." Had the U.S. ratified the Protocol, it would have committed the country to a target of reducing greenhouse gas emissions by 7% below 1990 levels between 2008-2012. The Obama administration has committed to cutting greenhouse gas emissions by 17% compared to 2005 levels by 2020 and 32% by 2030. In 2014, greenhouse gas emissions in the U.S. were 10% below 2005 levels. Since 1990, U.S. emissions have increased at an average annual rate of 0.3%. The Kyoto Protocol debacle in the U.S. still significantly impacts climate talks to this day, as negotiators search for a way to circumvent Senate approval, which is more unlikely now as Republicans have unified further against climate action. Wirth said that one of the most important lessons learned since the Copenhagen and Kyoto summits is that "we can't do this from the top down." The world is not ready for an agreement in which everybody puts out their own resources. "The world is not ready for an agreement in which everybody puts out their own resources," he said. "In the model for Paris, individual countries are making their own commitments." Going forward, he also thinks that corporate presence will be very powerful in aiding climate negotiations. "The presence and pressure from the many, many hundreds of international businesses that realize this is a big issue—we need to get them to weigh in with the lobbying," Wirth said. The required weight needed for this may be starting to accumulate. For instance, on October 16, the CEOs of ten large oil companies—mostly based in Europe—declared their intention to "strengthen actions and investments" in an effort to reduce greenhouse gas emissions from the energy sector. The companies, including Pemex, Statoil, Shell, and Total, also call for an "effective" climate agreement at December's COP. During a White House summit in late October, 81 U.S. companies with over nine million employees joined the American Business Act on Climate Pledge. By signing the pledge the companies, which include Kellogg’s, McDonald’s, Facebook, Nike and Disney, are voicing support for a strong Paris outcome. Furthermore, in mid-October, 14 multinational companies, including fossil fuel-interests BP and Shell, signed a statement saying they "believe the Paris agreement should commit all parties to undertake nationally determined efforts to reduce greenhouse gas emissions." The companies, which have more than 1.5 million employees and over $1 trillion in annual revenue, say they "recognize the rising environmental, social, economic, and security risks posed by climate change, and that delaying action will result in greater risks and costs." They also say an effective response will require "strong government leadership." Wirth, who is now the Vice Chair of the United Nations Foundation and the Better World Fund, has devoted much of his career to providing this leadership, and he has seen his efforts seesaw through several decades of climate change growing pains. It is statements like these from multinational corporations that give him hope that a countervailing force to Citizens United will eventually change the trajectory of climate politics, and eventually, climate science.